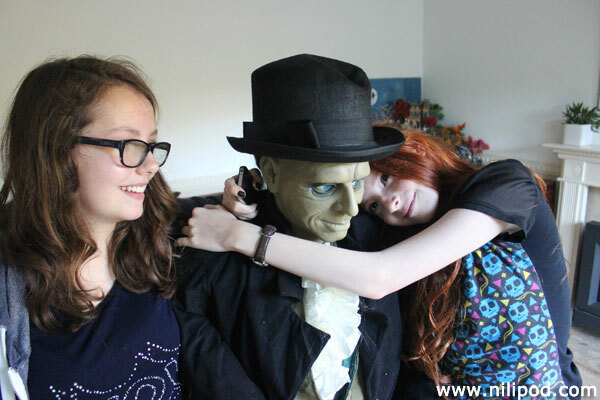 This is our incredibly creepy moving Halloween butler statue that we bought from our Asda supermarket a few years ago for £70. We don't think that they sell him anymore, so it's great that we managed to buy it when we did. Although it is officially named Egor, we call it Riff Raff, off of the iconic Rocky Horror Show movie (played by Richard O'Brien himself). We like to put it outside the lounge door, so that every time we leave the room, we jump, especially as it has a sensor that makes it move and speak when it detects movement. It made Liv scream everytime she walked into the hallway.